GUISELEY lost their nine game unbeaten run when they slipped to a 4-2 defeat at Yorkshire rivals York City in the National North yesterday. 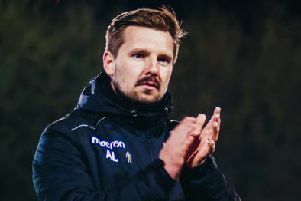 It was an ideal start for Guiseley when from the first cross a York City player handled it and Kingsley James, fresh from scoring a hat-trick last week, calmly converted the penalty to give the visitors the lead. It could have been two for the Lions when Cliff Moyo crossed for Paul Clayton but his effort was saved by City goalkeeper Adam Bartlett who just got his body in the way. The hosts would soon level matters, Jordan Burrow had an effort saved by Joe Green but the ball fell to Macaulay Langstaff who couldn’t miss with a tap-in from three yards out. The Minstermen then started to take control of the game, creating several chances but were missing them, until a corner with 38 minutes gone wasn’t cleared and Jordan Burrow was in the perfect place to score from three yards out. A real moment of quality almost doubled York’s lead when Sean Newton hit a fine free-kick from the edge of the area but his effort hit the crossbar and was eventually cleared. The home side continued to press and got their third goal when another penalty was awarded for a foul in the area, Newton stepped up and calmly converted his effort. Newton would soon double his own personal tally with another goal, this time he controlled a pass in the area and with time and space made it 4-1. The visitors got one back when a long throw wasn’t cleared and Scott Smith scored from five yards out. That proved to be the last meaningful action of the game and it was York City who left with the victory. Elsewhere, Bradford Park Avenue moved up to third place in the National North table, as Connor Branson scored the only goal of the game against Alfreton. Just moments after Jake Beesley had failed to find an empty net, Branson headed in Nicky Wroe’s 71st-minute corner to settle matters.